The hay tarp has become useful for the farmer, who often needs to protect his hay from the elements, animals, and other external things. Despite their name, hay tarps are actually used for much more than hay. The average farmer will have a whole gamut of uses for these handy accessories, making them nearly a necessity for any farm setting. Weather conditions are often unpredictable. And wet hay will mold and mildew quickly, making it unfit for use. Farmers use hay as feed and bedding for their animals, making it an extremely important substance that needs protection. 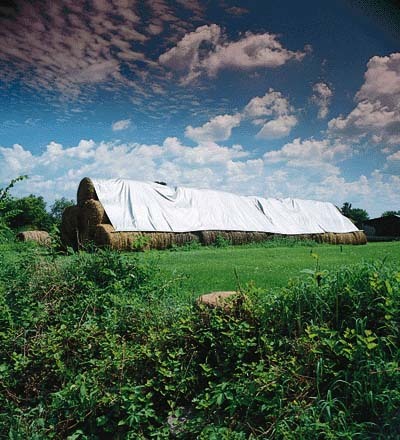 The hay tarps can be used to protect it from the elements when it is necessary to keep it outdoors. Some hay bales are created to stay out on the fields year round. This method requires much less time and work from the farmer. However, the bales still need protection from the elements. The easiest way to provide protection is to cover them with a tarp that is made specifically for this purpose. Sunlight can also damage hay under certain conditions. Often farmers will cover hay bales in the summertime to prevent them from becoming dried out from overexposure to the sunlight. This is where the hay tarp plays it's biggest role. The words hay and farm are almost synonymous. Farmers may cut and bale their own hay to sell to others, but they also use it on their farms. Transporting these bales can be a tricky job. They must be stacked on the trailer in a certain way to keep them from tipping. A smart farmer will make use of the hay tarp to keep these bales in place during the transportation process, especially if they are in the back of a truck where they will have to deal with stiff drafts. Hay is vital to the sustenance of many a farm. And just as the hay has become so vital, the hay tarp is as well. This hay tarp looks great in the picture. Hope our hay tarps look as good as that.